Frankly, I’m surprised it took us this long to gobble this entry right up on the Omnivore’s list. Ok, I’ll admit it right off – I love comfort food. I don’t like the massive amount of exercise I need to conduct to burn off one of these babies (540 kcals in the burger alone), but sometimes? Totally worth it. With me having extra time at home lately, I decided recently I needed some alone time with one of my favorite lunchtime pleasures. Don’t dis me – it’s not as expensive as a Ray’s Hell Burger and more convenient for me than a Five Guys. It’s a childhood thing, I think. Speaking of which, remember the old McDonald’s commercial? 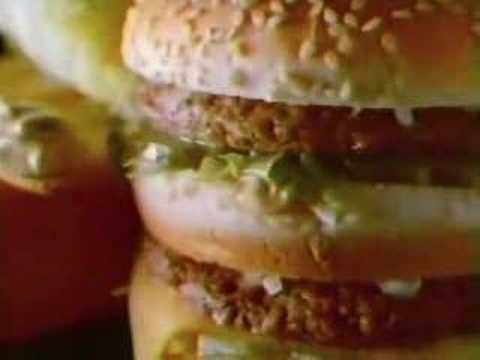 So the Big Mac is a staple of vintage American fast food. Two thin burger patties – combined, they’re still less than a Quarter Pounder’s offering – lettuce, cheese, three parts of bun, pickles, onions…and the special sauce. Supposedly, secret. But most tend to think (and I agree) that it’s a one-off form of Thousand Island dressing. Interestingly, when I went to research the burger, I found that the sauce is delivered in sealed canisters and directly dispensed to the burger in a “sauce gun” that is specially calibrated to release a specified amount for each trigger pull. How scientific! Most caloric? Mexico, at 600 kcal. Least? Malaysia, at 484 kcal. Now, keep in mind the kcal count is only the burger. 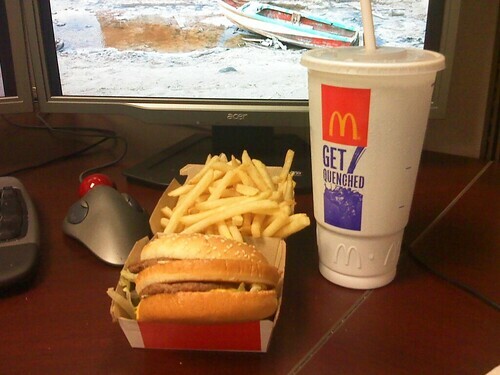 But this is the whole Value Meal #1 we’re talking about: Big Mac, fries, drink. So a typical meal – sandwich, medium fries, Coke – will cost you calorie counters 1130 kcals off your Daily Average, not counting whatever dipping choice you use for your fries. Shocking. That’s almost half of your recommended caloric intake. But is it worth it? When you need something quick and filling, something tasty and decadent, I think so. It’s nearly a complete meal, not some slab of mudpie or triple-layer chocolate cake. It shouldn’t take any research to figure out why the T-Island dressing is delivered in canisters and dispensed with a sauce gun. They serve so many of em’ that they have to do it that way.